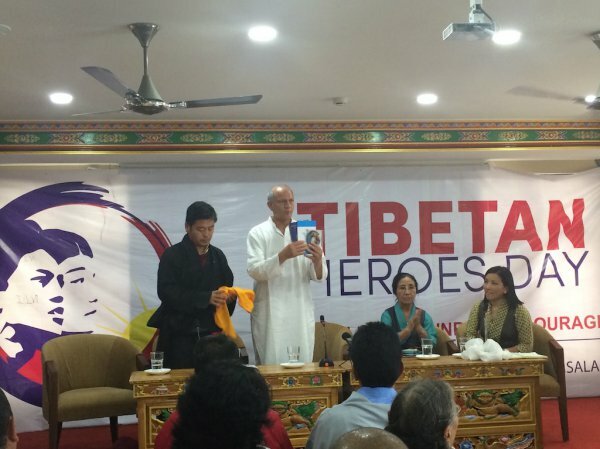 As a mark of commemoration of the first anniversary of Tulku Tenzin Delek Rinpoche’s passing on 12 July 2015, numerous Tibetan NGOs have marked the occasion with the creation of the “Tenzin Delek Rinpoxhe Medal of Courage”. Having been forced to live the remainder of his life under the detention of Chinese authorities, the memory of Tenzin Delek was used to highlight those Tibetans “unfairly imprisoned for their roles in the struggle of Tibetan freedom”. Yeshe Choedron, a medical doctor by profession, is currently serving a sentence of 15 years in prison for allegedly providing and disseminating state secrets and information to the exile 'separatist forces' outside Tibet. TWA President Dolma Yangchen received the honor on the political prisoner’s behalf as the organizers, International Tibet Network, Tibetan Women's Association (TWA) and Students for a Free Tibet (SFT) India, could not find any relative or associate of Choedron here in Dharamshala. The Deputy Speaker also stated that the Tibetan struggle should have unified motive and voice. He also offered his respects to all those Tibetans who have sacrificed their lives for Tibet and to those who are still languishing in Chinese jails. "Tibetan Heroes' Day" will be commemorated each year on the death anniversary of the Philanthropist Lama to highlight the Tibetan struggle against Chinese rule in Tibet. Tenzin Ngodup, a former student and member of Tulku Tenzin Delek Rinpoche Service Community, said that Trulku's followers inside and outside Tibet would never accept China’s claim that he died a natural death. He also presented the 'Tulku Tenzin Delek Memorial Scholarship' to Tenzin Tsomo of TCV Selakui who scored 94.2 in the 12th CBSE Board exam. Ajay Singh Mankotia, President of Indo-Tibet Friendship Association, launched a book on Rinpoche in Tibetan and English languages, along with a short documentary made by his students. Trulku died on July 12 last year under suspicious circumstances. His body was not handed over to his relatives who allege that he might have been poisoned. HIs relatives had claimed they saw his skin and nails turned black.